It’s a goddamn disgrace that only now, over 75 years since her comic debut, is Wonder Woman finally receiving her own big-screen movie – sure, there have been TV shows and such about the character, but never an actual film, despite her being among the top tier DC heroes alongside Superman and Batman, and being arguably one of the most iconic figures in all of comic book lore. 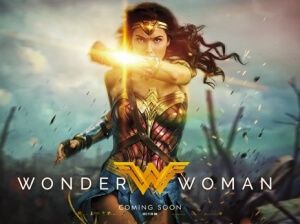 Call it what you will, whether it be rampant sexism within the industry or the overwhelming distrust of placing a female-led superhero movie into cinemas after the failures of other such films in the past (thanks, Catwoman), but now her time has finally come – Diana Prince, aka Wonder Woman, is front and centre in her own film at last, and she’s not only saving the day but also saving an entire universe; the DC Extended Universe to be exact, which everyone and their grandmothers know by this point hasn’t gotten off to the best start, but thanks to her heroic efforts has now firmly put it back on track. The film, directed by Patty Jenkins whose previous credit Monster saw her direct Charlize Theron to an Oscar, allows us to see the humble origins of Diana (Gal Gadot), who grows up as the only child on the female-populated Amazonian island of Themyscira, where she trains to become a fierce warrior under the tutelage of her aunt Antiope (Robin Wright). However, the outside world comes a’knockin’ when an American pilot, Steve Trevor (Chris Pine), crash-lands and is saved by Diana, who learns of a brutal war happening in the world of men and, deducing that this is the work of the god of war Ares, decides to go and help put an end to the conflict. Once in the world of men, she learns of the severity of the First World War, as well as the unusual customs that women are expected to abide, but nevertheless she persists and becomes the warrior she has been training to be. What this film has that pretty much all the DC movies up to this point do not have is a sense of both focus and character; it knows exactly what it wants to set out and achieve in terms of its story, and it contains fully fleshed-out characters with actual personalities that you truly want to see turn out okay by the end of it. The tone is dead-on, being dark and serious when it needs to be while also being funny at just the right moments (something that the gorgeous cinematography represents beautifully), unlike some of the past ones where they would arguably favour one tone over the other and not feeling particularly balanced as a result, while it is paced very smoothly since it allows you to really soak in the atmosphere and the people that we are slowly growing to like. Jenkins deserves a hell of a lot of credit for making everything feel so seamless and on point, with hardly any scene or moment feeling out of place – except for, perhaps, its CG-overloaded climax which definitely feels like we’ve trodden back into Batman v Superman territory, but luckily it doesn’t ruin what it otherwise a pretty strong movie. Central to what makes this film so strong is Gadot’s sweet and emotional performance as the Amazonian warrior herself. Her brief appearance was undoubtedly one of the highlights of Batman v Superman, and here she gets the chance to fully embody everything that her character stands for and be an actual hero, eager to help those in need even when she is told there is nothing she can do for them. Placing her character in a First World War setting obviously goes against her WW2 origins, but here it works because this was a war with no actual good side, as both were as bad as each other, and having her be in a situation where men are being dastardly in their tactical planning every which way makes her journey to become a hero for those that deserve her help all the more interesting, and Gadot sells both the character’s naivety and determination in this scenario with great ease. She also shares great chemistry with Pine, and some of the best scenes in the movie are just the two of them talking to each other as they’re learning a bit more about one another and their own respective views on the world. They, and the fine supporting cast of fun characters roped along in their adventure, make the film infinitely more watchable than it already is. While there are still a few problems – the villains aren’t very interesting, and of course that third-act climax reeks of the same kind of CG-overkill that plagued the finales of Man of Steel and Batman v Superman – they don’t fully distract from this being a superb and even inspiring superhero film that easily puts the DC universe back on track, but also deserves mention in the argument of what can be considered one of the finest superhero films of the 21st century. Sure, Marvel may currently hold the crown of being the standard-bearer to beat, and despite this film DC has a long way to go (don’t let us down now, Justice League), but if Wonder Woman is any indication of things to come, then we will finally have a legitimate roster of superheroes to make Marvel seriously worried. To use a now-defunct political slogan, I’m with her. Wonder Woman easily puts the troubled DC Extended Universe back on track with its strong ability to tell a coherent and focused story with actual characters that are given time to shine, including a fierce and wonderful (pun intended) lead performance by Gal Gadot who completely embodies the classic comic book superhero and her good morals, making her a hero for the ages not just for audiences, but for DC who seems to finally be moving steadily in the right direction, if this fantastic slice of entertainment is anything to go by.